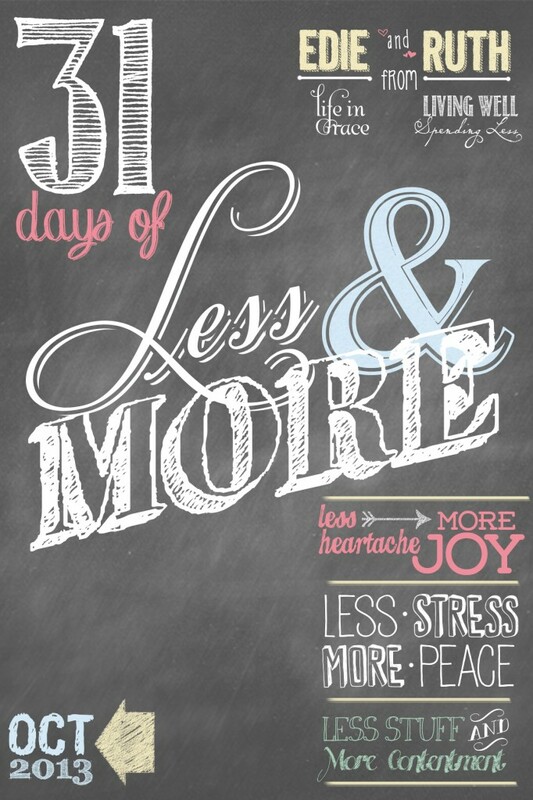 This is Day 1 of our 31 Days of Less & More challenge. To read all the posts in order, start with this post, then visit the Overview Page to see the outline for the whole series. Last October, after practically killing myself to write & publish a post every day for a whole month, I swore that I would never again do another on of the Nester’s 31 days series. I loved 31 Days of Living Well & Spending Zero, but by then end of the month, I was exhausted! It was just too much work, too much stress, too much energy….just too much. After a lifetime of always wanting more, I think I’ve finally come to a point where all I really want now is less. Less distraction, less stress, less heartache, less stuff. At the same time what I truly crave is purpose, joy, peace, and contentment. When I talked to my dear blogging friend (and accountability partner) Edie about the idea of doing a 31 Days of Less series, she embraced it completely, but she also pointed out the other side. The opposite of less, of course, is more. Nature hates a void; if there is less of something, what will fill its place? What if, she suggested, we did a series together? 31 Days of Less AND More. Each day could tackle a different goal—LESS of one thing and MORE of something better. Edie and I are so excited to share this series with you this month. It will be a little different from my regular lineup of blog posts, but my hope is that it will offer something even better. We hope to offer nourishment for your soul and the encouragement you need to make a series of small adjustments that can together add up to a very big change. We have been working on it together for the better part of six months now, and we have been praying daily that this will truly be a month of blessing to each of you. So as not to overwhelm you, each of our posts will be short—500 words or less—and together will give you one small challenge to focus on each day. You can do as many or as few of these tasks as you feel able. Our goal isn’t to stress you out, but to offer practical tips and encouragement as we walk through this journey together. The series will be broken up into three main parts. Part One—days 2-11—will focus on filling our lives with less heartache and more joy. Next, Part Two—days 12-21—will focus on creating less stress but more peace. Finally, Part Three—days 22-31—will hone in on our physical spaces and focus on having less stuff but more contentment. We will be encouraging lots of support and discussion on our Facebook pages, so be sure to “like” both Living Well Spending Less and Life in Grace on Facebook if you don’t already! Finally, for those of you who want to do another 31 Days of Living Well & Spending Zero, please feel free to do that too! These two series can definitely be tackled at the same time, and I will be joining you in a month of zero spending. If you would like to join the no-spend challenge, be sure to join the dedicated Facebook group here, where I will be posting the challenges from last year each day. 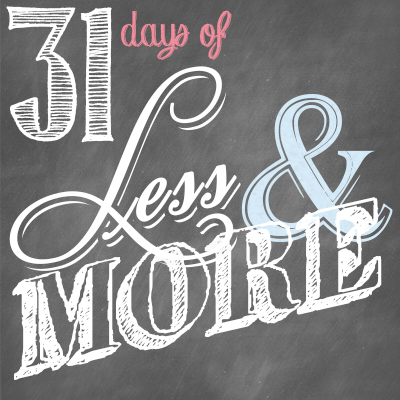 Commit to joining us for 31 days of Less & More! Public accountability is a powerful motivator, so we strongly encourage you to let others know that you are IN! Leave a comment below or on the LWSL Facebook Page. 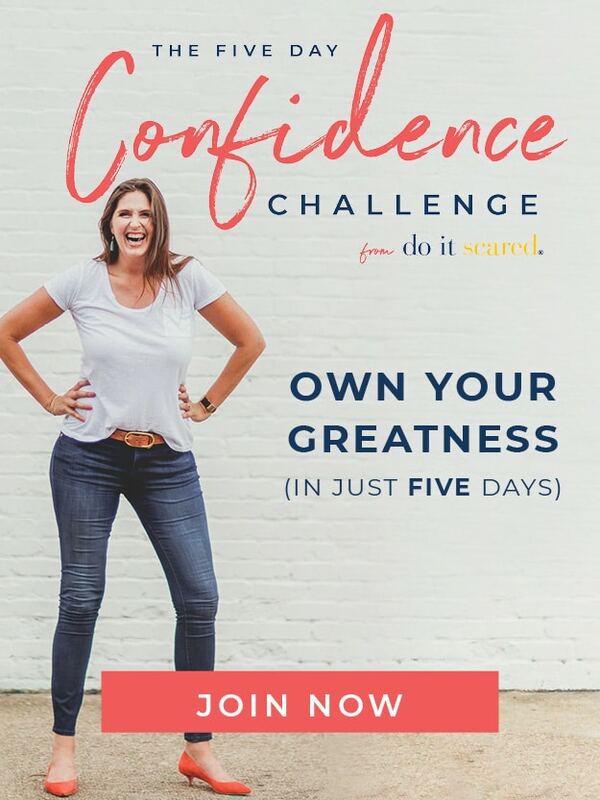 Even better, post about this challenge on your personal page so that your own friends & family can encourage and challenge you, or perhaps even join you! Are you ready for this challenge? What are your fears or concerns? What are you most excited about? This is awesome! I’m in! I’m definitely in! October sounds like the perfect month for a challenge like this! I have to replace my phone, but I don’t have to have the fanciest one. I chose one that will do the job well and not need replaced for quite some time. I can’t wait to read your ‘less versus more’ 31 days! I could use help with both! October is exhausting – but in a wonderful way. I’m looking forward to pondering less / more with with – and Edie! So excited it’s finally October so we can get going with this challenge! Really excited for it! I’m IN! I’m going to really try to SPEND less as well. NO shopping for anything ‘extra’ and decluttering! I’m ready to attempt to declutter my life in order to fill it with what I truly love!!! I’m in …..Sounds like a wonderful series. ….! My husband and I were just talking about tackling some debt by embracing less. Cant wait to see your posts! I am accepting your challenge of Less and More, at least I hope. Life has forced me to have less, now to work on the wants and be satisfied with simple and be full. I look forward to this series and the timing was impeccable. Found out about this series and came here from Edie’s blog. I’m looking forward to reading what you both have to say every day in October. This could not have come at a better time! I’m so ready. I can’t wait to learn & grow from this challenge! Soooo ready! I know this is going to be great! Thanks for putting this together. I am in! I’m in. I stated on Friday. Why wait. It’s going to be a great month, and I’ve already gotten a lot done around the house. I am a little nervous but I am in! Going to “try” the zero spending but I don’t think I’ll be able to!! AHHH! I’m IN. In fact, I started on Friday with my husbands last paycheck. Let the saving, cleaning, and purging begin. Time to start enjoying life with less. Ok, so my computer keeps auto correcting my old website into the website field. So, I’ll just leave my new one here in the comment field. www. dtothefourth.wordpress.com. Thank you. Sorry for the duplicate comments. I am in! Ready for this challenge at this crossroad of life! I’m in. I need to declutter my house and my families lives so we can live better, financially, spiritually, and emotionally. I’m in as well! 🙂 Thank you! I’m a bit nervous about committing to be honest, but I so want what you are offering.. more of the good stuff and less of the bad, so what the hell… I’m in! Yes, I will try to join in each day!! Good idea! I am completely looking forward to every post in this series. I know that the two of you are a dynamic duo. September and October have always felt like the start of a new year! So this can be very encouraging to a lot of people, including myself! Bring it on! Brilliant! I love the dual-side approach. People often think that more stuff leads to more happiness/contentment. It will be very nice seeing how you ladies show how less really can be more. 🙂 Definitely will follow the series! Looking forward to it. This is what I’m searching for- Aug 30 was my last day of working outside the home. I’m going to try the 30 days of no spending challenge first. We just bought a car and I need to seriously kick my spending habit. I have a tendency to go overboard around Halloween too. This sounds great and I’m hoping to do it. I usually don’t get on the Internet everyday but I’ll try to keep up! Thank you for this post. It is a great way to realize how much we are overspending our budget as well. I really wish we could do something like this. I’m working on building my stockpile up a bit, and then we may try it. We usually eat out once per week and spend a little extra on various things we don’t need. I’m just not sure if my husband or I have the willpower. I’m ready! This will definitely be a challenge . Can I be half-way in? Maybe do a post on each subject? 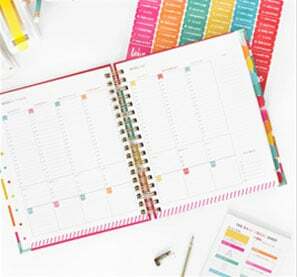 My main goal would be less computer time and more time with family–which is very hard when I babysit 4 days a week, 5 children, and fledgling blogger–plus I already agreed to do 6 blogposts with other bloggers this month. But I think it is such a needed topic, and I would love the challenge it would give me of thinking through and meditating on these subjects. I am in. I have done this whenever I can, but we live on a lake and the relatives come often so not always possible! This is going to be such a huge blessing for me! So many things have been going on in my life and I have felt totally alone. I’m so glad to have found a place for new ideas and support. Thank you! I just began digging around your site and love it! I am in for the challenge! I did 31 Days of Orange several years ago. It was great fun, but it is a marathon. Good luck! I am so excited about this! So ready for Less & more in my life !! I’m in! So want to have less stress, less stuff more joy more purpose. I just found you and have spent the last 90 minutes reading your stuff. Ok. I’m in. i’m late but i’m in! my heart has been yearning for this! just this past week I asked one of my closest girlfriends to be my accountability partner of spending. Hi, Ruth! I just started catching up on email and saw this challenge (if you will) and I am IN! I am excited to see where this takes me and what the Lord and all of you will teach me. I am not sure how well I will do seeing that I am taking care of my hubby post surgery but with the change of seasons I think that I am ready for other changes as well. Let’s start! I’m joining late. I’m in the midst of my second move in less than a year and a half. I’m widowed and retired and have much of the stuff of someone who has taken things from my parents under my wing. The first move meant downsizing from a 3 bedroom/2 bath/garage/storage shed home to a 2 bedroom/2 bath/storage garage duplex. Sold and donated what I thought was a ton of stuff. Fast forward to today as I’m packing to move to a 1 bedroom/1 bath/no storage MIL apartment in my daughter’s brand new home. Everything that is not essential is going to the consignment store or being donated. I’m a scrapbooker/cardmaker/quilter so my bedroom will be my studio and I will be sleeping in the living area on a daybed. I’m learning that less is more and that things are not thoughts, and that being close to current family is more important than old things from family of origin. Looking forward to spending some time with the challenges I’ve missed and the ones to come after the big move on Sunday. I am IN.. So glad I found this..
I’m all for this. I am going to give it a go. I’m a bit late, as usual, but I’m definitely in! I hope I can still get in on this. Retirement is a few years away and I’m to the point that I want to clean everything out, get rid of stuff, and simplify, simplify, simplify. I stumbled across your blog and realized this is just what I need. A 31 day challenge to keep me on track and create new habits. I’m in. Looking to replace this blog with social media like Facebook for 31 days. Just discovered this lovely site. I’m in…late….but in….beginning my 31 days today. Not sure if this is still going as it is 2 years old…but I’m in for a much needed change. !